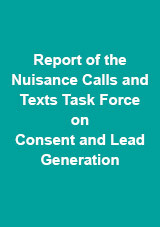 The Nuisance Calls and Texts Task Force on Consent and Lead Generation was convened by Which? at the request of the Department of Culture, Media and Sport (DCMS), following the publication of the DCMS Nuisance Calls Action Plan in March 2014. The work of the Task Force is not intended on its own to solve the problem of nuisance calls; our proposals are designed to be complementary to, and should be read in conjunction with, the other initiatives underway as a result of the DCMS Action Plan. The Task Force has focused its attention on how organisations use consumer consent to carry out direct marketing activity (including the proper implementation of TPS screening) and how they buy and sell potential customer leads. We strongly believe that consumers should not be confused or misled by requests for their consent, and businesses should make sure that they only purchase personal data which has been legitimately obtained. Screening against the Telephone Preference Service (TPS) is an integral part of that consent process. Consumers subscribing to the TPS have an expectation of protection against cold callers. Our recommendations are designed to help reduce the incidence of unwanted calls and texts received by consumers by improving the ways in which marketing organisations, regulators and government treat consumer consent to receive direct marketing by telephone and text. We want more organisations to raise their standards of practice in these areas. This will require businesses, and the individuals who lead them, to demonstrate a commitment to putting consumers back in control of their personal data and protecting them from nuisance calls and texts. It also requires regulators to work together, to enforce the rules and to provide more practical guidance, and for the Government to provide leadership. Download the full Nuisance Calls Task Force Report.